LAS VEGAS — B.B. King kept drawing fans Friday in Las Vegas, and a family feud simmered, during a public chance to say goodbye ahead of a weekend memorial service and a final King of the Blues road tour leading back home to the Mississippi Delta. 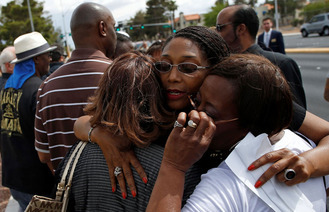 More than 1,000 people streamed past the body of the music legend during a four-hour public viewing, said Matt Phillips, manager of the Palm South Jones Mortuary several miles west of the Las Vegas Strip. Ushers ran out of 900 printed cards bearing King's dates of birth and death and lyrics to his signature song, "The Thrill is Gone." A steady string of King's hit songs — "Everyday I Have the Blues," ''Sweet Little Angel," ''Why I Sing the Blues" — never stopped as ushers directed people to move past a casket framed by floral arrangements and two of his guitars, always called Lucille. "Dad is just loving this," she said. "This is part of his homecoming." "I'm very upset," she said. "I don't want to be out here disrespecting my father's rest. But something's wrong here." But Marilyn and Tommy Burress weren't disappointed. The couple from Milwaukee knew when they heard B.B. King had died that they had to pay their final respects. They were in Las Vegas this week for Tommy Burress' 72nd birthday. "It's inspiring to see how many lives he touched," Tommy Burress, a retired auto worker, said afterward, "how many people loved his music and loved his attitude — friendliness, friendship and love of the people." Pam Hargraves, 50, flew to Las Vegas from Providence, Rhode Island, because she couldn't bear not to say goodbye to a performer she'd seen maybe 50 times at venues around the world. "I just knew when he passed, wherever he was, I would be there," she said. The viewing was followed by a Friday night musical tribute at a rock 'n' roll venue on the Las Vegas Strip hosted by Shirley King, who performs as Daughter of the Blues. In King's Mississippi hometown, Indianola, hundreds of people were expected to attend the B.B. King Homecoming Festival on Sunday, a free gathering he started 35 years ago. They and three other children — Washington, Willie King and Barbara King Winfree — refer to themselves as a family board. They've hired a lawyer to handle their complaints. "We're his children," Patty King said after a private family viewing of King's body on Thursday. "We're going to fight with every breath in our body." Toney, who worked for King for 39 years, said she's doing what B.B. King said he wanted. "They want to do what they want to do, which is take over, I guess," Toney said of the family group. "But that wasn't Mr. King's wishes."